Brick fans, start your engines! 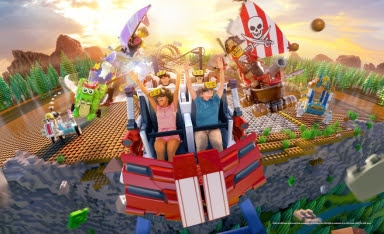 The newest attraction at LEGOLAND® Florida Resort combines roller coaster thrills with virtual reality (VR) technology to put guests in the center of an action-packed road rally where the laws of physics and aerodynamics only loosely apply. Now open at the multi-day vacation destination, The Great LEGO® Race invites guests into a virtual world where they’re the star of a rollicking race against several LEGO minifigure competitors — all while taking an exciting roller coaster ride.